Create, Print and Share Your Own Polyhedral Nets! 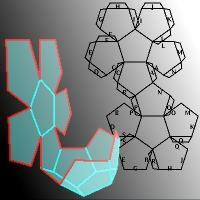 On this page, I've provided some special software to help you design and make polyhedral nets. Polyhedral nets are a great hands-on exercise for kids, or even adults. You print out the net onto cardboard, cut it out, then carefully glue it together into a three-dimensional shape. It's not origami, but it's much easier to make all sorts fo fascinating paper and cardboard polyhedra! When I was a kid, I'd have to draw my own polyhedral nets onto cardboard with a ruler and a compass. There were also books you could buy (there still are, I'm sure, but these are the best I could find) with the nets printed with beautiful patterns. 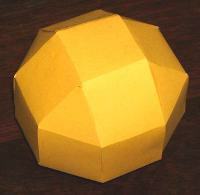 Now, with the internet, there are thousands of printable fold-out nets of polyhedra you can download. But what if you have some special idea for a polyhedron you want to make, but you can't find a net for it? The good news is you can use the java applet on this page - as long as your browser has the right java plugin installed. You can design your nets right on this web page - no need for any special downloads! You can see your polyhedron in 3D before you print out the net! You can share your polyhedra by email, facebook, twitter etc. You can save your net to your hard disk, or save a picture of it to email to your friends. To use some of these features, you'll have to "trust" the java applet. If you have a java plugin installed, you would have seen a box saying "do you want to trust content from Dr Mike's Math Games for Kids?" If you said "Yes", you'll be able to save and print. If not, carry on and use the program anyway, or hit "refresh" on your browser and say "Yes" this time. 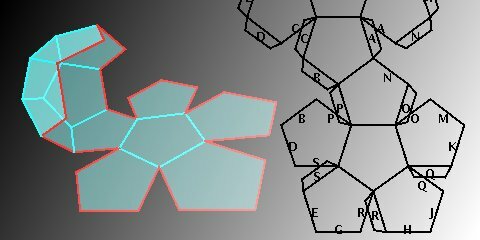 I've put a video on youtube explaining how to use this polyhedral net java applet. You'll need to have a java plugin installed in your browser to use the applet. It's a free download from Sun. I've also provided you with the net, generated by the software, of a Truncated Icosidodecahedron. Get yourself 9 sheets of cardboard (and maybe a couple spare), print out the net, and get busy with scissors and glue! Your final product will be almost 7.5 inches (19 cm) across. The applet is just below this paragraph. Click on "Signed" or "Unsigned" depending on what features you want. If you want something hands-on for making polyhedra, that doesn't need scissors or glue, I strongly recommend the Klikko range. this one is the one I've got and it's great!